FAT CHEF TO SLIM – MARTIN VOWS TO BATTLE THE BULGE! One of Donegal’s best-known chefs is to eat his own words – by going on a diet! Martin Anderson, of the Crest Catering Company in Letterkenny, admits that he has battled with his weight for years. But now he has announced that he is finally to take matters into his own hands starting today. 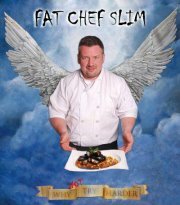 Martin, 44, will officially weigh in today and keep track of his progress on his blog ‘Fat Chef Slim’. Martin has no great plan to shed the pounds but plans to eat nutritional and wholesome foods and take some exercise in a bid to drop a few trouser sizes! “I have struggled over the years with my weight and I have made a decision that 2012 is going to be the year to lose it,” he declared.